While filleting a fish it is vital to have a sharp knife by your side ready to go. By having a knife that is specifically made for filleting fish can help to ensure that you get all of the meat off of the fish in a clean, effective manner. If you’re like me you’ve probably been using the same knife that’s been passed down from generation to generation. The knife I’m use to using once belonged to my grandfather and has since been passed down to me. Of course there’s nothing wrong with an old fillet knife but technology has changed drastically since those days. So if you’re on the market for a good fillet knife or you’re looking to upgrade from an old hand-me-down. You might be wondering “Whats the best fillet knife for salmon?”, “Whats the best fish cleaning knife?”, “Whats the best fillet knife for fish?” or “Whats the best fillet knife for trout?” Here’s our list of the 5 best fish fillet knives for the money in 2019. Rapala’s Fish ‘n Fillet knife is one of the most well-known, best-selling knives ever – with more than 40 million sold over the last 50 years. It’s a popular choice that’s trusted by fishermen throughout the United States and all over the world – and it’s not hard to see why. Whether you’re fishing on a boat, from a pier, or near your campsite on a lake or river, you need a reliable knife that will efficiently cut up your catch. The Rapala is built from durable European stainless-steel. Its progressively-tapered, flexible, full-tanged blade has an ultra-sharp edge that will make quick work of filleting any fish. The precision blade will also ensure accurate cutting so that no valuable meat is wasted. It is securely fastened to the Rapala’s finely-crafted, classic birch handle, which will provide you with a firm, sturdy grip while you cut – even in slimy conditions. The Rapala comes with a fine-tooled leather Laplander sheath to protect the blade when you’re not using it, and it features a “safety-first” free-swing belt loop that’s designed to keep the blade away from your body as you wear it making it one of the best fishing knife . Additionally, the knife has four blade sizes to choose from. It can easily be re-sharpened and comes with a single-stage sharpener, so you can confirm the blade’s edge will stay razor-sharp for a long time. Based in Mora, Sweden, Morakniv has been manufacturing top-notch knives since 1891 – and all of their products are built with quality materials and careful craftsmanship. Their Fishing Comfort Fillet Knife features cutting-edge technology to provide you with a clean, quick, and safe filleting experience. Its blade is made from cold-rolled, Sandvik 12C27 Swedish stainless-steel and is effective on nearly every fish size. It is sharp, tough, and corrosion-resistant, making it especially well-suited for anglers who will be cleaning fish in a saltwater environment. The blade is 6.1 inches long and just 0.07 inches thick, giving you the precision to swiftly slice through meat and bones because its one of the sharpest fillet knives. The blade is firmly fastened to a patterned, high-friction TPE rubber handle that will give you a trustworthy grip as you cut. The handle is also cold-weather resistant – so you can use it year-round – and includes anti-odor technology, so it won’t retain the smell of fish blood and guts once you’re done filleting. For protection, the Morakniv comes with a rugged, slotted plastic sheath that has two belt clips – a loop and a clip-on – so you can decide what’s most comfortable for you. The knife also features easy-clean polymer edge protection, and the blade, handle, and sheath are all simple to clean after use. The knife also comes standard with a limited lifetime manufacturer’s warranty. It’s not enough to simply have equipment that will land you fish – you need to be able to clean them, too. 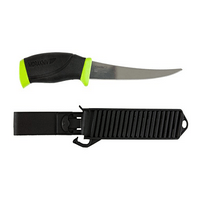 A quality filleting knife is an essential part of any fishing kit. It can make or break your entire experience – and can mean the difference between enjoying your catch for dinner or heading home empty-handed. Rapala has been engineering fillet knives for a half-century, building quality products to help fishermen efficiently prepare their catches. Their razor-sharp Fish ‘n Fillet Superflex Knife lives up to their reputation. It provides outstanding control and flexibility. 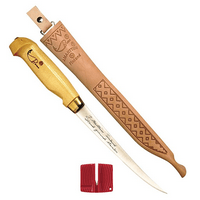 The 6-inch-long blade is designed to smoothly cut through the meat, bones, and insides of any fish. It features a hand-ground, stainless-steel blade that’s made with through tang construction. It’s also layered with a PTFE non-stick coating, allowing you to quickly make cuts with ease while the fish’s meat swiftly falls away. On top of this, the blade is corrosion-resistant, guaranteeing its longevity after years of use around fresh and salt water. It is attached to a checkered, baked birch handle which will provide you with a surefire grip, even in wet conditions. Additionally, the Superflex comes with a tooled, genuine leather sheath and belt loop – so you can safely and confidently keep it by your side. It also comes finely finished with a polished brass ferrule. 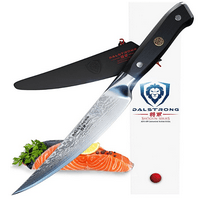 When it comes to effectively cleaning fish, the Dalstrong fillet knife is top-of-the-line. It’s chock-full of features to make the filleting process easy and enjoyable – so you can spend less time preparing your catch and more time cooking it. This knife’s notable features begin with a strong foundation. It’s made from 66 layers of high-carbon stainless-steel that are corrosion and stain-resistant. It boasts a sharp AUS-10V Japanese super-steel cutting core at 62+ Rockwell hardness, giving it optimal cutting power. And the Dalstrong’s 2-milimeter-long blade has a razor-sharp edge that’s perfectly balanced and tapered to reduce surface drag, allowing for smooth slicing. Yet while its blade delivers top performance, the handle is equally impressive. The knife’s military-grade, non-slip G-10 handle is resistant to heat and cold – giving you a comfortable cutting experience in every season. It’s also moisture-resistant, allowing you to maintain a solid grip and fillet effectively in wet conditions. Additionally, the handle has an intricate copper mosaic, an engraved end cap, and a hand-polished spine that’s crafted into a comfortable shape – providing you with consistent control. The Dalstrong also comes with a matching sheath that employs a traditional pin and string locking mechanism – protecting the blade and your fingers while you’re not using it. The knife comes with a 100-percent satisfaction or money-back guarantee as well as a lifetime warranty against defect. 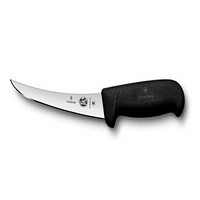 The Victorinox Curved Fibrox Pro Boning Knife is lightweight, comfortable, and strong. You’ll be impressed by its set of features – whether you intend to clean trout, tuna, northern pike and anything in between. Weighing just 1.6 ounces, this knife is smartly designed with careful attention to detail. It’s stamped from one cold-rolled, high-carbon sheet of steel. Then it’s ground, tempered, and sharpened – processes that give the knife its strength and durability. Conically grounding the blade through its entire length and width gives it greater flexibility and a wider breaking point, lowering its potential to fracture under pressure. The semi-stiff blade is then hand-finished by expert craftsmen in Switzerland before being shipped all over the world. One of this knife’s most noteworthy features is its curved edge, which enables an optimal working angle and precision slicing through fish meat and bones – particularly around challenging areas like the ribs. The knife comes with a slip-resistant Fibrox handle, so you can cut with confidence in any environment. It’s also hygienic, easy to clean, dishwasher-safe, and approved by the National Sanitary Foundation. On top of this, the knife is versatile and long-lasting. It’s corrosion-resistant and capable of withstanding years of use, regardless of whether you enjoy fresh or saltwater fishing. It can also be easily re-sharpened. All of Victorinox’s products come with a lifetime manufacturer guarantee. We hope this answers your questions about what is the best fillet knife and you now have the ability to make the right decision and get the best fish filet knife.